Tracey's Chocolate Chip Cookies symbolizes an insatiable chocolate chip cookie urge that can't wait for a package to be delivered in the mail, you'll want to try this cloned version fresh out of your home oven. Just be sure to get the cookies out of there when they are turning light brown. This way they'll stay soft in the middle when cool. For even better results, you can chill the dough overnight before you commence with the ceremonial baking. 2. Grind oats in a food processor or blender until fine. Combine the ground oats with the flour, baking soda, salt, and cinnamon in a medium bowl. 3. Cream together the butter, sugars, vanilla, and lemon juice in another medium bowl with an electric mixer. Add the eggs and mix until smooth. 4. Stir the dry mixture into the wet mixture and blend well. Add the chocolate chips and nuts to the dough and mix by hand until ingredients are well incorporated. 5. Spoon rounded 1/4-cup portions onto an ungreased cookie sheet. Place the scoops about 2 inches apart. You don't need to press the dough flat. 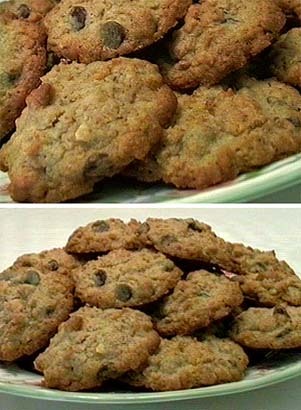 Bake for 16 to 18 minutes or until cookies are light brown and soft in the middle. Store in a sealed container when cool to keep soft. For the best results, chill the dough overnight in the refrigerator before baking the cookies.